The Special Events Area of MSC Hospitality primarily focuses on our organization’s hosting duties. We feel hosting is an integral part of service and each year we assist an array of organizations and entities throughout Texas A&M and the Bryan/College Station community. 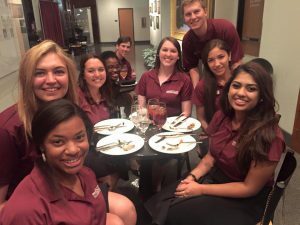 We are constantly searching for new avenues to assist other entities in fulfilling their event needs by providing the best minds and spirit Aggies have to offer. Our goal is to become a quality and reliable source of event assistance, to create lasting partnerships with the entities we serve, and to help our members develop their leadership abilities through the service to others.